Quentin Tarantino’s Death Proof, his latest movie after the one-two punch of Kill Bill Vols. 1 and 2, is part of Tarantino and director Robert Rodriguez’s homage to the grindhouse movie culture of the 1970s. The two directors decided to make their tribute by trying to faithfully embody what grindhouse cinema is – aside from the themes of their movies, they also decided to show it back –to-back just like the “double feature” practice during that time. Death Proof, Tarantino’s grindhouse take, is vintage Tarantino. All the elements that you have come to expect from a Tarantino movie are here – and he really brings in bucketfuls of “Tarantino-isms” to the screen. You’ve got the imaginative shots and perspectives, the lightning fast witty repartee, and the pulpy plot and story that is filled with obscure pop culture references. Tarantino has really honed his personal style to a razor’s edge and Death Proof shows it in spades. Trying to give short description of the plot of Death Proof will be futile because a synopsis will not do the story any justice. It is Tarantino’s penchant for making the different scenes of his movies twist, fold, and bend into each other that makes it quite difficult. 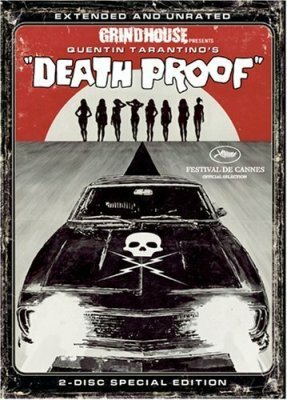 The great thing here is that Death Proof is told from a straight narrative, with absolutely no flashbacks or post-modern story structures like the one Tarantino used in his breakout movie Pulp Fiction. It is precisely because of Tarantino’s immense talents that the movie feels like it folds in on itself without even screwing with the narrative. I absolutely love the fact that the two “halves” of the movie is punctuated by probably one of the most memorable crash scenes in recent history. It serves as a dramatic counter point that signals the end of the first half, if you will, and the beginning of the second half. I think it is really clever. You enter the first half not really knowing where the movie will go then you see the crash scene so by the time you get to the second half you already have this immense sense of foreboding. This new set of girls are going to get it too. That’s what drives the second half of the movie – the impending sense of doom. But Tarantino still manages to turn the tables on us by actually pulling in another twist. This time, it is the Stuntman (devilishly played by Kurt Russell) who gets the surprise of his life. Tarantino mined a lot of talent for this movie. Russell is just picture perfect for his role. Rose McGowan’s cameo of sorts is very memorable. CSI New York’s Vanessa Ferlito is a revelation here. She really dove into her character with gusto and that lap dance sequence is just phenomenal. Same goes for Rosario Dawson, who provided her character with the right amount of zing. I know that Death Proof has polarized a lot of people, this is one of those “love it or hate it” type of movies. I for one loved it and this is another fine addition to Tarantino’s already impressive filmography. The ending wasn’t exactly sitting well with me.